As managers, colleagues, parents and friends, we are constantly transmitting information to the people around us, and the messages we choose to broadcast create success or hold us back. New research from the fields of positive psychology and neuroscience shows that small shifts in the way we communicate can create big ripple effects on business and educational outcomes, including 31 percent higher productivity, 25 percent better performance ratings, 37 percent higher sales, and 23 percent lower levels of stress. 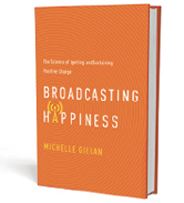 In Broadcasting Happiness, Michelle Gielan, former national CBS News anchor turned positive psychology researcher, shows you how changing your broadcast changes your power by sharing jaw-dropping stories and incredible research. Learn Michelle’s simple research-based communication habits that have been featured in PBS program Inspire Happiness and Oprah’s 21 Days to Happiness class.